The only thing certain about life, besides death, is change. Today, the year is half over (approximately). It seems like only yesterday that it was New Years Eve. Things seemed a lot more certain than they do now in my life. Only yesterday, the freezing winds were blowing and snow covered everything here in upstate New York. Now, roses bloom. It is raining - again. Things are so out of balance, with rain desperately needed on the other end of our North American continent. To everything there is a season. And to several people in my life, great changes are coming in this season of their lives. Change is coming to my life, and the life of my spouse, too. 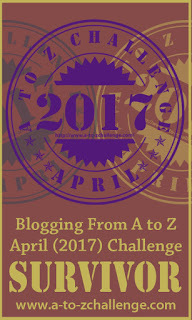 I will blog more about this as time permits..
Today, I end two blog challenges. 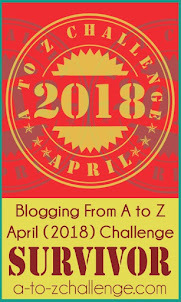 Next month I will not participate in any blog challenge. 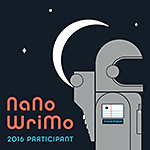 I will participate in Camp NaNoWriMo, but I've set a low goal and it will basically be a diary of my July. For my readers, there will also be some changes. I still intend to post daily but July's blog posts will consist of a mix of "throwbacks", new posts, and whatever I have time for. One reader suggested I tell stories about my childhood growing up in the Bronx, and perhaps I will pull some stories out from a rough first draft of a memoir I worked on a couple of years ago. To everything there is a season. 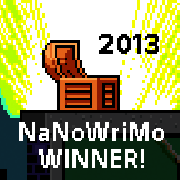 I am a writer and this will not stop me from writer (she said, bravely). What will the second half of the year bring? Have you had any surprises in your life (good or bad) this year? Yesterday, I woke up a little before 5am. The sound of heavy rain does that to me. I lay in the bed. At one time, I loved the sound of rain. But, as someone who has had experience with her neighborhood flooding, the sound is stressful now. It has been since September of 2011. I couldn't sleep. Then, a bird started to sing. I knew it was near dawn, because that is what birds do. Sing. Even if flooding is just around the corner. It was too dark to go down to the park near the river, several blocks from me (complete with flood falls that were breached "last time"). And, I really didn't want to know if there was any water in the basement. So I lay there, listening to the other birds who were joining the first bird in the daily pre-dawn chorus. I listened to the rain, bathed in anxiety. Finally, I went downstairs to my laptop, and started to write today's post. I looked at my smartphone. No weather alerts. Relief. For now. The rain stopped and I went back to sleep. It rained on and off yesterday, as it did in much of the Northeast. I will just have to wait patiently and see what happens. Although the United States Civil War officially ended (for the most part) 150 years ago this past April, I've always maintained that the war never truly ended. Now, in the almost two weeks after a tragic mass murder during a Bible Study class at a Charleston, South Carolina church, we are seeing still another battle in this seemingly never ending war. Whether our country will have a true dialog about race, and the legacy of the Civil War as a result of this horrific act, or if it will just be a lot of empty talk and then business as usual, remains to be seen. But the war that has been simmering under our surface is now more public than ever. At least surface changes are made. Perhaps the changes are symbolic, or won't hit upon the tough issues, but the fact is - people are thinking. I am not blogging today to express my opinions. Rather, I want to show you pictures of some of the sites that have been in the news. It's hard to explain this to my readers in Great Britain and India, but I will try. Even a month ago, in my wildest dreams, I would never have imagined the events of the past almost two weeks. 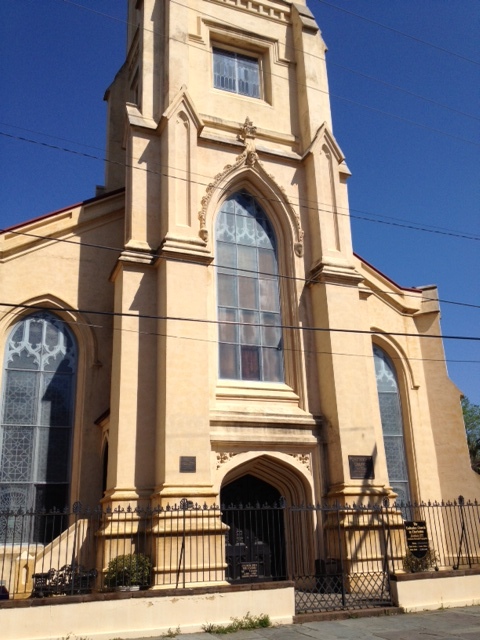 With the College of Charleston, where one of the funerals took place on Friday? Their President is a former state senator (noting one of the dead in the shooting was a state senator) and a former lieutenant governor, and was a controversial choice when hired last year. This is the South Carolina State Senate Chamber, where the Reverend Clementa Pinckney, one of the murdered nine, served. 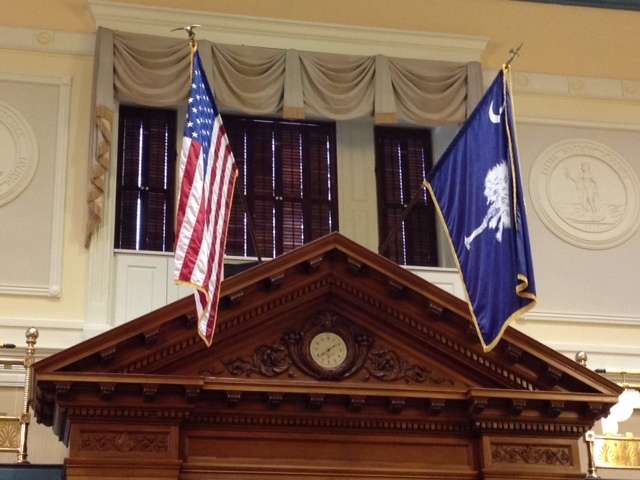 The American flag is on the left and the South Carolina state flag on the right. Outside this chamber, a Confederate flag flew near a monument on the grounds of the State Capitol. Now, debate rages on whether that flag should be taken down. The above President of the College of Charleston? His views on that question. Many Southerners will have to ponder how best to celebrate their heritage. 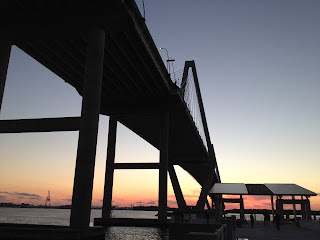 The Arthur Ravenel, Jr. Bridge, which connects Charleston, South Carolina with Mt. 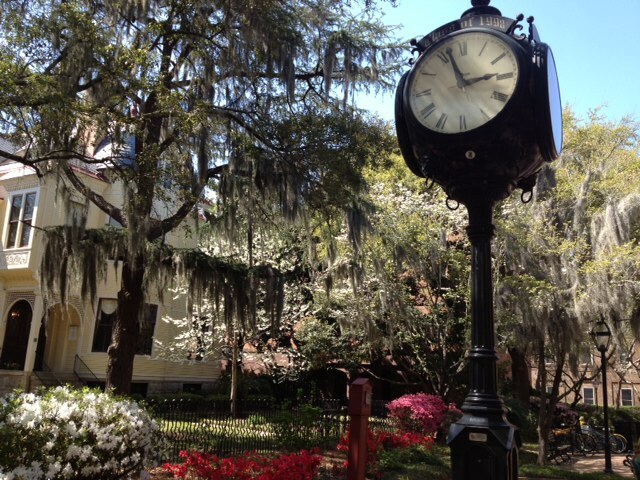 Pleasant, South Carolina, is a favorite destination for walkers and bikers. I've walked on it a number of times (and completed the entire walk in both directions once). A week ago today, thousands of people (perhaps 40,000) marched on this bridge. Some joined hands in a "unity chain" to show support for the people of the City of Charleston. But the elderly man the bridge is named after - now 88 years old- is, himself, controversial. There was an effort to rename the bridge earlier this year, which failed. 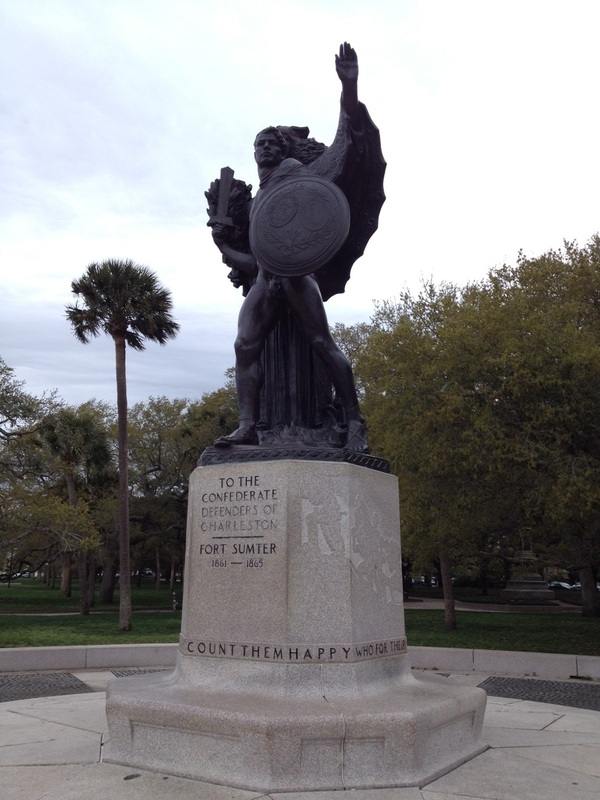 This Civil War Confederate Monument in Charleston was defaced several days ago. (I totally reject this kind of activity, be it a Union or Confederate monument.) Debate now is taking place about whether these monuments should be taken down. This is a Virginia Sons of Confederate Veterans license place (picture taken by me at a Civil War reenactment I attended). A Confederate battle flag design is on the left side. This specialty plate, it appears, will no longer be permitted. Some former Confederate states had incorporated Confederate flag designs in their state flags. They are now rethinking it. Could this be because the shooter was photographed burning an American flag, and holding Confederate flags? But, although the Confederate flag is publically debated, it must also be noted that there are thousands of streets, parks, and other public places named after Confederate figures - one, in particular, stirring controversy, due to what he did after the war. The families of those murdered, the people of Charleston, and people of the South, have some hard days coming as they must work out the direction their future will take. I had the below post set up in advance, thinking I would be out of town at my mother in law's house today. But, we had to cancel due to weather. Now, besides having to worry about heavy rains and possible flooding, I actually have FREE TIME. Well, some free time. I'm already sending texts and emails related to caregiving - ah, well. I hate to say it, but I have so much from my life put to one side, and now I have some time to concentrate on it. The lawn needs mowing. Our garden, which we are on the verge of abandoning, is crying for us (and will have to continue to cry, given the rain.) 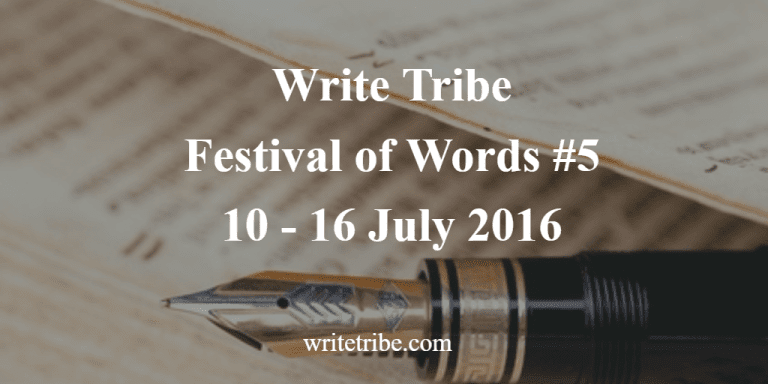 Even, yes, blogging, needs to be caught up on. But, because of the events Wednesday before last in Charleston, South Carolina, I still want to run this "throwback" post. 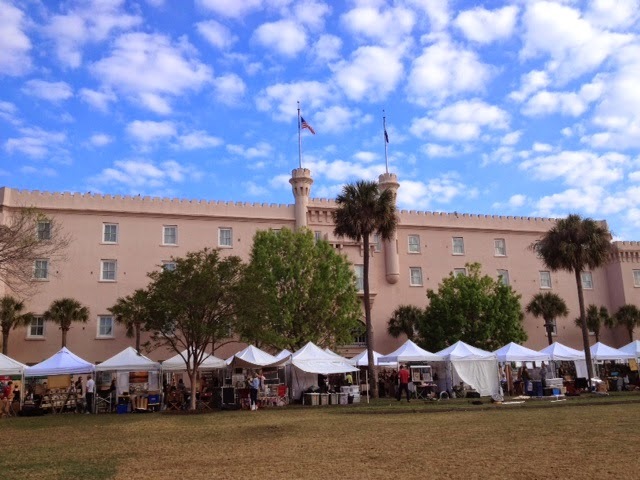 I am going to blog about one the most beautiful locations for a farmers market that I have ever seen. This was, with some edits, a post from April of 2014. 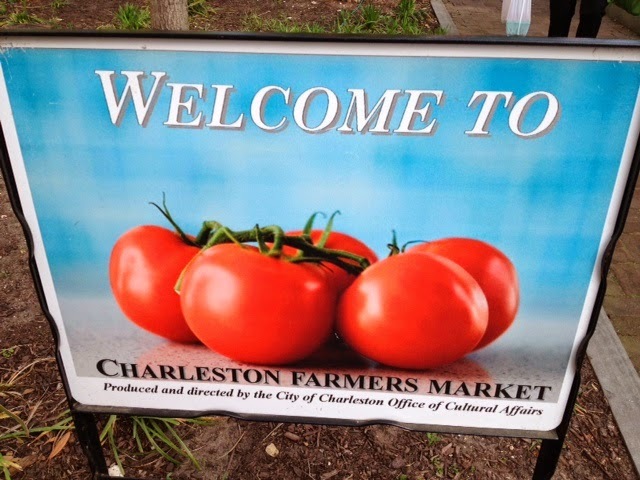 This market is blocks from where the tragic Charleston church shooting took place earlier in June, killing nine people of color engaged in Bible Study. For all I know, one or more of the murdered shopped at this market. Perhaps they walked through its location in Marion Square. Just ordinary people like all of us, until a horrific moment thrust them into the history books. Of such is history made, and we continue to mourn nine lives cut short prematurely. Perhaps it is a little bit disrespectful to run this. I hope not. 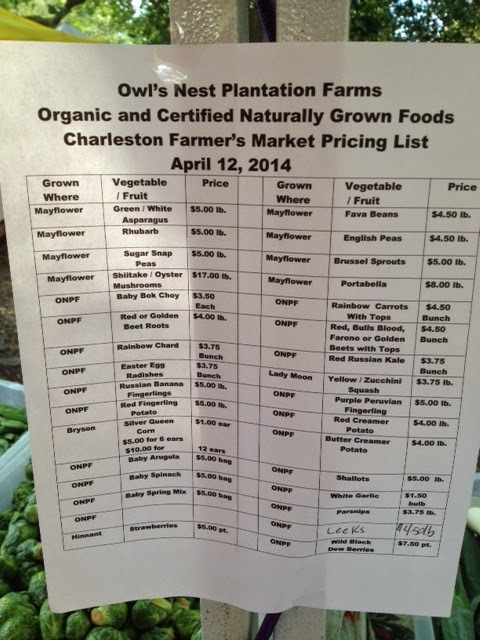 The Charleston market did not disappoint - with one exception - not all of the food is local. 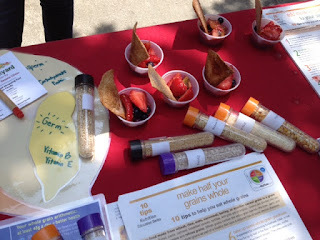 But there was a local food information booth, and I talked to two energetic young women attempting to get the word out. In a city where world famed restaurants are on almost every streetcorner downtown, I hope the word does continue to get out. I still think of Charleston daily. I think it will be a long time before I stop. I've been invited to participate in a meme called "What She Said" created by Kimberly Montgomery at Fifty Jewels. I'm told not to be politically correct, to tell it like it is, and so forth. She says "This is not your grandmother's midlife." Well, that's true. One of my grandmothers never made it to age 50. So, Kimberly, thank you for the invite, and I am going to tell you about my life right now. Yes, I have an empty nest. Yes, life is good. But, in this season, much of my life is not my own. You asked me for a quote. So here goes. "I am a long distance caregiver to a mother in law in her upper 80's. If there is a "Mid Life Boulevard", caregivers live on the side streets, mainly forgotten by all those liberated from their nests, and enjoying substances and acts I can not mention in a family type blog (although those acts create families). Yet, we are essential. Like our grandmothers, we care for those of the generation above ours. And, when it is our turn, we hope our children (or friends, if we are childless) take care of us." Sometimes it can be a real drag. It's 9:30 pm, and the load of laundry I started earlier is still drying. I worked at a full time job today (my spouse worked, too), exercised, participated in some phone calls with in -law family members (and a visit from another inlaw) and packed so I could travel with my spouse to my mother in law, some three hours away. She had a procedure today and the person who cared for her has to leave tomorrow afternoon. We're down there to help out, and, at the same time, to help my mother in law downsize and eventually move to be near us. There is so much to do, so many moving pieces, I have a spreadsheet (started by a co worker, thank you!) devoted to keeping it all together. Tomorrow, my spouse and I both work, and then, we are on the road. While we are, I hope the swelling in my spouse's knee (injured during other helping out) stays down. Now (bear with me) I am going to change the subject slightly. In the past three weeks, three people in my life fell. One fall came from a by product of radiation treatment. My good friend of 52 years, in her third year of battling cancer. One was a friend, also in her 60s. In a rush, she tripped over an obstacle in a parking lot. She is a caregiver for her sick sister. But the third fall happened to my mother in law. It is fortunate my spouse and I were in the house when she became disoriented in a dark living room and fell. I've been taking a fall prevention class the past six weeks. I've learned about falling, how to help after a fall, factors that influence falls, and so much more. So I'm an expert, right? Some help I was at first. For the first few seconds after hearing her calls for help, I went totally blank, before some of my teachings started coming back to me. But I did recover enough to remember some of what I needed to know. And you know what? It didn't work the way I thought it would. Not because the teaching was flawed. It wasn't. But the person who fell, due to physical limitations, couldn't do what the teachings asked for. That's OK. I am in the process of learning more in case this ever happens again. Besides what I've learned, there is an online resource called Caregiver College I am finding of help. I was so grateful to the two lovely ladies who run my falls prevention class, and the two physical therapists who have attended several sessions. Also, there is a free download online of a brochure from Australia. (see page 24-26 if you download it.) I don't know if this brochure is related to the falling program I am taking, but I do know this falling program originated in Australia. Again, I am not a health care professional but a layperson trying to prevent myself from falling again, and learning what I can since I am a caregiver for an elderly person. So that is my current journey through midlife. You're welcome. I hope I'm coherent, because it's been a long day, and tomorrow I won't have time to write this post. If you came here to find out how much fun it is to be a liberated 62 year old, you are in the wrong place. But if you came here for a slice of my life with its joys and flaws- welcome. One week ago today, I woke up, did exercises, made my lunch, got dressed, and turned on my computer. Seeing that "Charleston shooting" was trending, I clicked on the link and was plunged into a moment which has lasted all of this week. But I am so far removed from the reality that has touched the lives of an entire community in Charleston, South Carolina, a city that I dearly love yet have never lived in. I don't know anyone directly affected. I have no family in Charleston. Yet, day after day, I have seen events and have wondered: will our country finally have the courage to face truths that haven't truly been faced in 150 years? Even people who have little understanding of our Civil War are taking sides in this seeking and reacting that is taking place before our eyes. Events and opinions change by the hour. It would be something difficult to describe to my foreign readers. I hope they will bear with me in the coming days. I don't often publish my personal opinions on my blog. I am a teller of history stories. I don't want to have opinion distract from the history stories I am trying to tell. I don't have a direct link to the U.S. Civil War. Both sides of my family emigrated to the United States in the early 20th century, years after the Civil War was over. No one in my family ever owned slaves or fought in that war on either side. Yet I, a Northerner (native of New York City), lived parts of my life in three former (or maybe not so former?) Confederate states: Florida, Arkansas, and Texas. I've visited both South Carolina and Georgia several times in recent years (along with North Carolina, still another former Confederate state). In fact, I visited both Columbia, South Carolina (the city so in the news for the Confederate flag still flying on the capital grounds while a murdered state legislator of color lies in state in the building where he served - a building my spouse and I toured in March) and Charleston. In March, my spouse and I walked on the college campus where one of the murdered women worked. For all I know, I passed her on the street. While in South Carolina this past March (Columbia, Camden and Charleston), my spouse and I discussed the Civil War with several residents. I was shaped by my upbringing and these South Carolinians by theirs. Listening is not the same as agreeing. Sadly, events have proved me right. The Civil War is still being fought. But for now, it is time to remember the dead and honor them. Let us pause and remember the murdered, as the funerals begin. On Sunday, I will blog more about this in my Civil War Sunday post. Maybe it will be just a photo collage of the city I have grown to love over four visits in five years, including some places recently in the news. As the saying goes, we live in interesting times. In upstate New York, the lilies are in bloom. Summer is officially here. Today I bring you a little selection of these most versatile flowers. 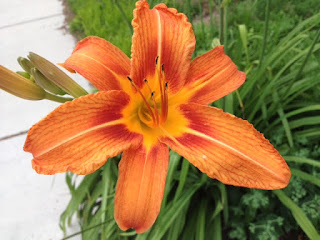 Growing them, day lilies especially, is easy in our zone 5b climate - here's how. Not all of these lilies are day lilies. I must admit, I am far from an expert on lilies - day lilies, the various Asiatic lilies, stargazer lilies. hybrids, oriental hybrids, and more. Let's just call them lilies. 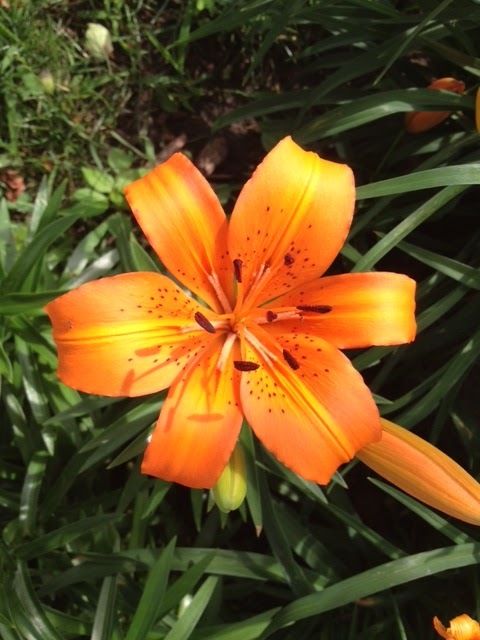 Let's enjoy some Binghamton, New York area lilies, shall we? This is part of the Broome County library garden, in downtown Binghamton, New York. Imagine - a library with its own garden. The garden contains shrubs, bulbs, roses, some works of art, and a picnic gazebo. 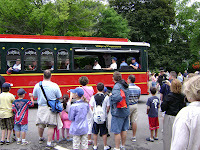 This is what it will look like in July. 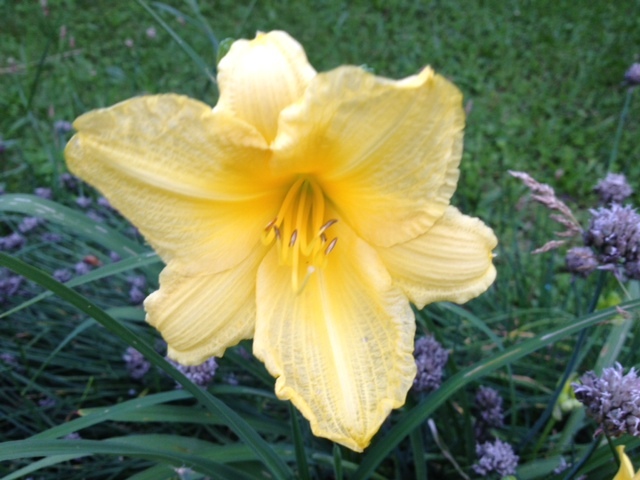 On Monday, I found my first day lily of the year, in its final moments, in my front yard. This is my earliest daylily, with more to come. On the West Side of Binghamton, orange lilies. I hope to feature more lilies in the next few days. What is blooming in your area today? A British blogger inspired today's post. She blogged about the "Sounds of Our Shore" project - an attempt by the National Trust (of Britain) to preserve today's sound of the British seashore for future generations. Another "we were just talking about that yesterday" coincidences. We were at my mother in law's house this past weekend helping her downsize (she has sold her house and is moving closer to us.) We talked about what is in the attic. In the attic is a box of old reel to reel tapes recorded by me, and by my husband, while we were dating and even before (meaning, the late 60's and early 70's). We discovered the box when my son investigated the attic in a visit a couple of Christmases ago. The songs aren't of interest to us - the quality would be terrible. And, we don't have a reel to reel player to play these tapes on. Ours is long gone, left behind in one of our many moves when we were newly married. But what is of interest are the commercials, jingles and airchecks. People collect those airchecks! (Here is a collection from a station hundreds of miles from where I lived as a child, but I could pick up the radio station at night). If, by some chance, we have an entire radio program on one of these tapes, there is interest in those, too. Here is a website that collects programming from a station where I grew up, WABC in New York City. These sounds of the past bring back so many memories of my childhood. A literal "blast from the past." Of course, the tapes could be too fragile to play. But it sure would be nice to listen to those tapes one last time. What memories do sounds bring back to you? 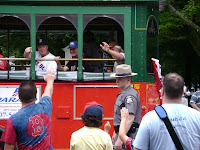 In 2009, I published a Fathers Day post about the time I watched a 90 year old former major league baseball player, one of the greatest of all time, play. I was so privileged to be able to spend some of Father's Day, 2009, with (sort of) Bob Feller, a great who has since passed away. I know many of my readers do not come from the United States and do not know our "national pastime". Yet, I think the theme of this post is universal. At his peak, Bob Feller could throw a baseball at over 100 miles per hour, something few people have ever been able to do. Yet, when he came out on that ball field in his 90th year of life, everyone cheered because he was still able to play the game. His skills were diminished but his spirit was intact. I am having to spend an increasing amount of time in long distance care giving duties concerning my elderly mother in law. I haven't been responding to commenters, but I wanted you all to know I still read, and treasure your comments. And now, my post from 2009, almost unedited. This "raw" early days blog post will have to do for today. I haven't followed baseball in many years. I got fed up back in the 1970's with the greed, and then later the performance-enhancing drug use. I enjoy minor league baseball but I haven't seen a major league game since 1973. This game was a step back to another time (although many of the players didn't retire or didn't play until after I lost interest). Postscript: Bob Feller passed away on December 15, 2010. The month before, he had turned 92. He was a "Hall of Famer" (a member of the Baseball Hall of Fame) longer than anyone in baseball history. Today, it is Father's Day in the United States. In the wake of the Charleston shootings of this past Wednesday, I want so much to step out of my "teacher of history" role and talk more about my belief that the United States Civil War has never ended. 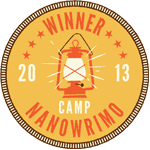 Perhaps, by next Sunday, I will be more capable of writing that post than I am now. So instead, I will turn to one of my past posts. Back in 2014, I wrote this blog post about the descendents of various United States Civil War figures. I intend to (as time permits - my time may be limited in the coming months) investigate what became of certain of the famous people of the Civil War - people we may never have heard of if the war hadn't occurred. But then I got to wondering - do these people have descendents living today? The answer may delight you. On major holidays, a major genealogy website, ancestry.com, offers free searches of various databases for its non-paying members. I decided to take the opportunity to do a little research on my mother's side of the family, one that I don't have that much knowledge of. I am more fortunate with my father's side, as an uncle did extensive research years ago. I quickly found I needed skills I did not have enough time to learn, but spent an interesting hour or more stumbling around the site. So, I decided to satisfy some of my curiosity today. Do major figures of the Civil War have living direct descendents? Years ago, I had met a man who had claimed George Armstrong Custer (although best known for his death in the famous Battle of Little Big Horn, he was also a Civil War general) as one of his ancestors. What other people related to the Civil War had descendents, and what had those descendents accomplished? What I found would take me many days to read about. Many people who know they are descended from historical figures in the Civil War are proud of that fact, but many also have the philosophy of "don't depend on your ancestry". It turns out there are a number of famous Civil War related figures who have living descendents- Confederates and Federal figures, abolitionists, and slaves. Reading through their stories is fascinating, and there are thousand of more stories waiting for the reading - civilians, soldiers and others who lived through the war. It is estimated that one in 17 people in the United States have an ancestor who fought in the Civil War. The story of Kenneth Morris, Jr, in particular, inspires me. A descendent of both Frederick Douglass and Booker T. Washington, he fights to abolish modern day slavery- just as his great-great-great grandfather, Frederick Douglass, fought to abolish slavery in our country. 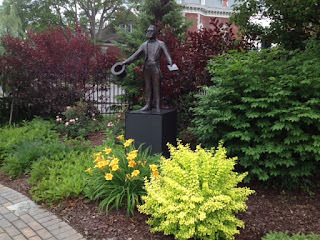 Then there is Ulysses S. Grant's great-great grandson, a native of Syracuse (a city about an hour from where I live) who is a museum curator and art expert. There is Bertram Hayes-Davis, who preserves the memory of his ancestor Jefferson Davis, best known as the President of the Confederate States of America. Confederate General Stonewall Jackson (who has a number of ties with New York State) has living descendents although he did not survive the war- his granddaughter, who passed away in 1991, was 104. Meanwhile, Dennis Chamberlain, a direct descendent of Union General and Battle of Gettysburg hero Joshua Chamberlain, is the latest of a long line of Chamberlains to service in the military. The Lee family of Virginia also has had a distinguished history, although many of them were not direct ancestors or descendents of the famous Confederate General Robert E. Lee. There is one missing name, though, from people alive today. Abraham Lincoln. The man who was President of the United States during the Civil War, has no direct descendents alive today. This is his genealogy. Do you have a famous person or historical figure in your family tree? Last weekend, we visited my mother in law's house. 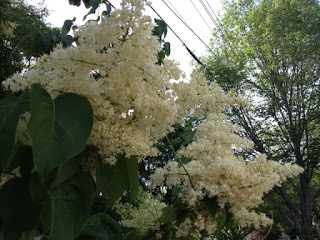 The privet hedges were blooming, and the heady fragrance lay heavy in the warm, humid air. Saturday night, my mother in law's next door neighbor came over to visit. She let me look at her Facebook page and I saw something amazing - she went to my local high school, back in the Bronx. 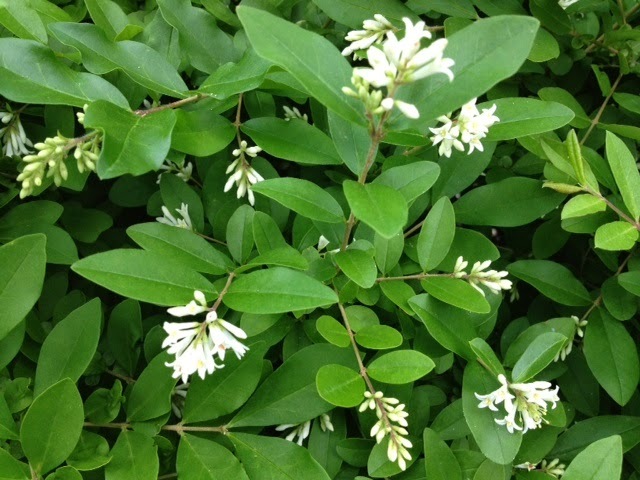 Today is the last day of spring, and I want to bring you back perhaps 55 years (OK, a teeny bit more than 55 years) for a special memory brought back by the scent of the old fashioned privet hedges in front of my mother in law's house. This is a post I wrote last June after a different visit to her house. A memory of over 50 years ago. I grew up in the Bronx, a borough of New York City, in a city housing project. All green spaces in the project were carefully fenced away behind chain link fences. We children would get into trouble with the maintenance men who cared for the project if we climbed the fences and dared to play in the greenery. So, of course, we did it as often as possible. In June, the privet would bloom. 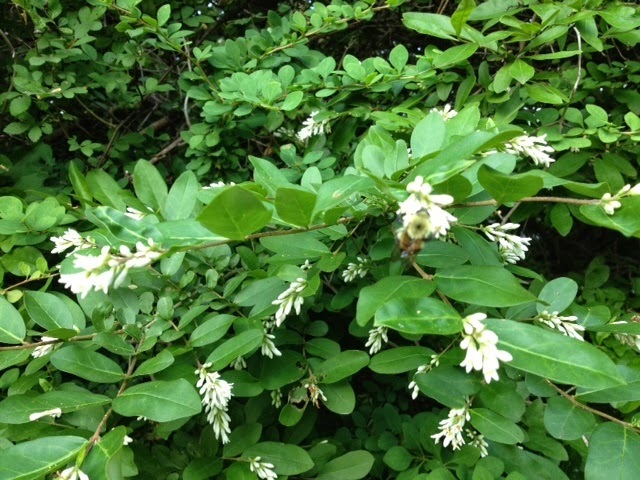 The blend of humidity and sweet privet scent would attract bees to the hedges. It's a scent I love to this day. The boys would catch the bees in glass jars. That's not something we girls really got into. Instead, we would look for ladybugs to catch. Yesterday, I visited my mother in law, who lives in a suburb of New York City. We needed to attend a court hearing with her. My spouse's petition for the guardianship of my developmentally disabled brother in law, "B", was finally being heard in court. 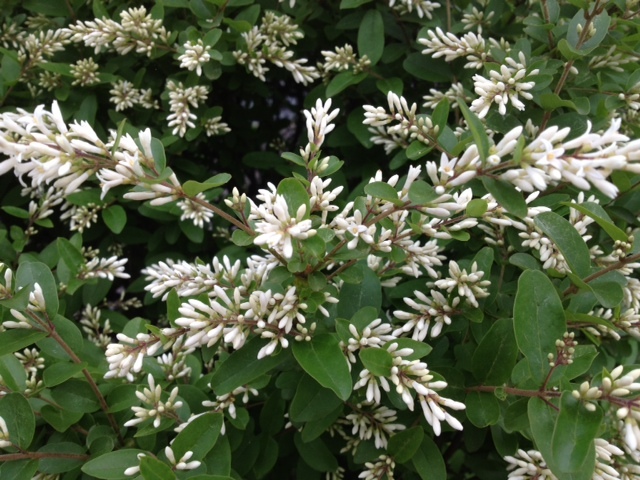 It was warm, and humid, and privet hedges were blooming in front of her house. They were swarming with bees. The heady scent brought me back over 50 years in a matter of seconds. I was a little girl once again, climbing chain link fences while we looked out for the project maintenance men, so my playmates and I could have a few minutes of interaction with nature. Scent and memory. A living time machine. Has scent ever brought you back to a favorite childhood memory? I've been reporting this month, in a "Falling Friday" feature, my experiences in a fall prevention course I am taking. I've learned about vision and its effect on falling. I've been taught exercises to build strength and balance, which is why I now walk an imaginary tightrope daily. I've blogged about my falling journey, if you can call it that. And, I've blogged about why, regardless of age we must all be concerned about falling. We were taught how to help someone who has fallen, or what to do if we, ourselves, fall. But, due to something tragic in the United States that happened Wednesday night, I must talk today about a different kind of falling. A National fall. Fort Hood. The American Civic Association ( the tragic mass murder in the city of Binghamton, New York not far from where I work-14 dead in an adult education classroom). Tucson, AZ at a meeting of some citizens with their United States Congressperson. Aurora, at a movie theater. A Wisconsin Sikh temple. Newtown, CT at an elementary school, which included a casualty (the school psychology) from our area. Washington Navy Yard. Ft. Hood (again). Isla Vista, CA. And Wednesday night: Charleston, South Carolina. Nine dead, one a state senator, after a racially motivated shooting at a Bible Study class at a historic black church not far from two places I have stayed in. My beloved Charleston, the Charleston I blogged so much about in April for the Blogging from A to Z Challenge, the Charleston that calls itself the Holy City because of all the churches that line its skyline, the Charleston now known for our latest mass shooting. 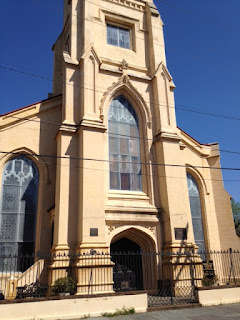 Think of Charleston today, I ask, and the sorrow of the families affected and all those who live in that area. Charleston doesn't have skyscrapers. It has church steeples. 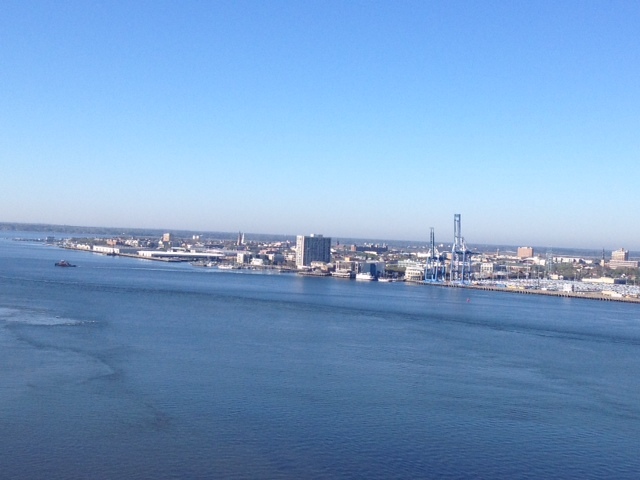 Hard to see in this picture, but this is the Charleston skyline. 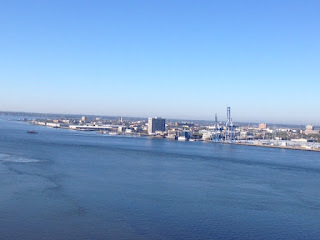 Charleston is a fascinating city, and I wish, in a way, that I was there right now. Even in the midst of what the locals call "dog breath summer". Yesterday, when I woke up to the news, I cried. At lunch, I cried some more. But tears won't help. Time after time after time, and we can't break the cycle. We lie there, and we cry, and we just don't know how to get up. Where is the falling class for us? How can we break the cycle of hate and violence? 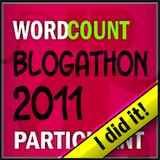 This is a post from June of 2009, the first year of my blog. So much as happened since I wrote this post. This is a post about the return of downtown Binghamton, New York - a small city of about 47,000. At its peak, its population was over 80,000. The 1990's and early 2000's were rough times for Binghamton - high unemployment and many vacant buildings. But things are turning around - faster and faster, now. Much of the growth is due to developers taking vacant buildings and converting them into student housing for the increasing population of Binghamton University, a highly regarded public university. The building I wrote about below, the Press Building, suffered a fire in December of 2010 and lay vacant for several years. Fires are far from unknown in downtown Binghamton. The planters pictured here were abandoned. But now, finally, the building (it is said) will be renovated for student housing, and will reopen sometime next year. The end of spring is approaching at incredible speed, or so it seems to my middle aged senses. Last night, I sat out in my backyard, looking at the plants and so grateful I can still enjoy my backyard. Birds sing, a siren in the distance wails, and squirrels chatter. June 17 is a day of some sadness for me, because it was my parent's wedding anniversary. Their marriage lasted a little more than 14 years, as my mother died too young. Later this year will be the 50th anniversary of her death. But then, I think of all the beauty around me. Unlike my mother, I am privileged to enjoy it and bring it to you, my readers. 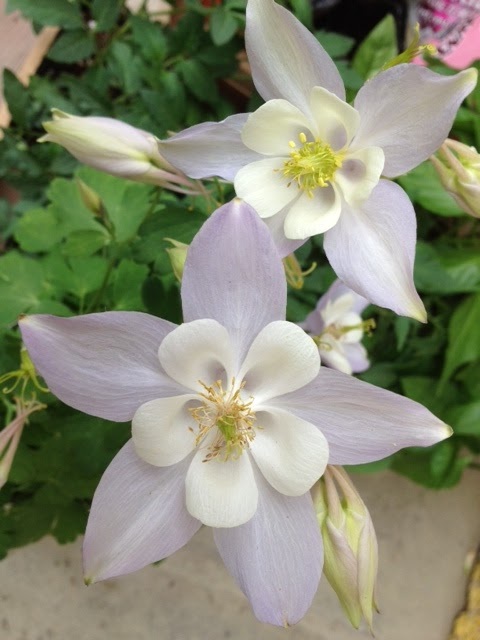 So many plants are finishing their bloom times right now. Here are some pictures taken in the last two weeks. 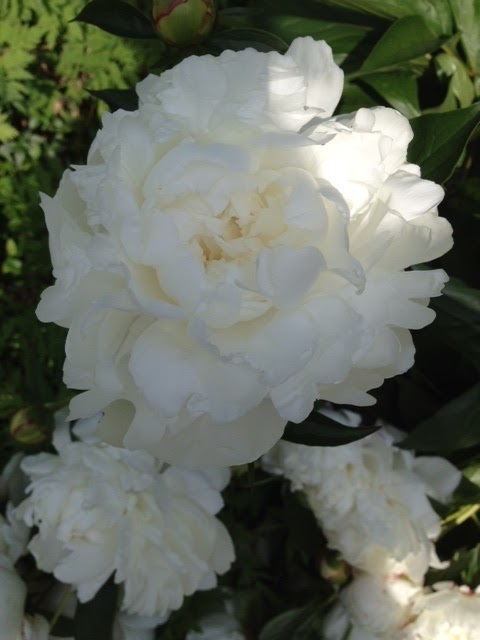 As it happens, all the flowers I chose today are white. And, none of them belong to me. 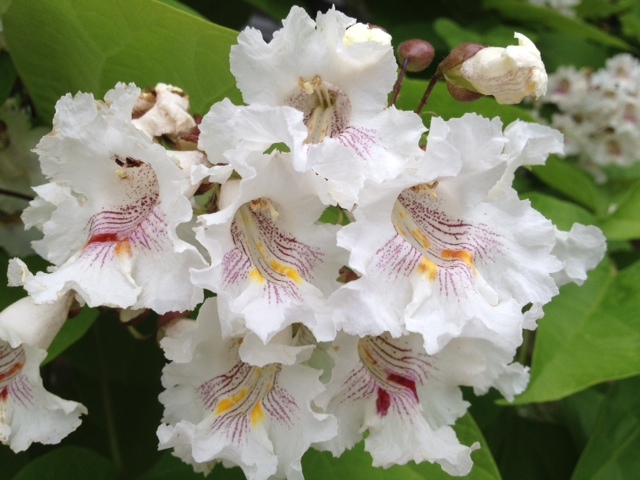 It was a spectacular bloom year for catalpa, a native tree. This specimen grows just a few feet from my property. A Korean Lilac. This was taken last week where I exercise walk in Binghamton, in upstate New York, but the blooms are still going strong today. 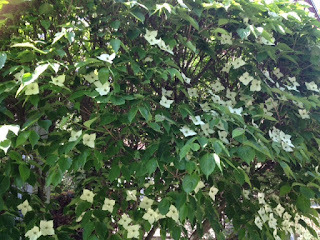 Korean dogwoods, another plant still going strong today. Finally, privets, which bring back memories of my childhood. These are finally starting to fade, along with their heavenly scent. Next week I start my Wednesday summer feature, which I am thinking of naming "Summer Ramblings". Flowers are special to so many people. What flower means something to you, and why? 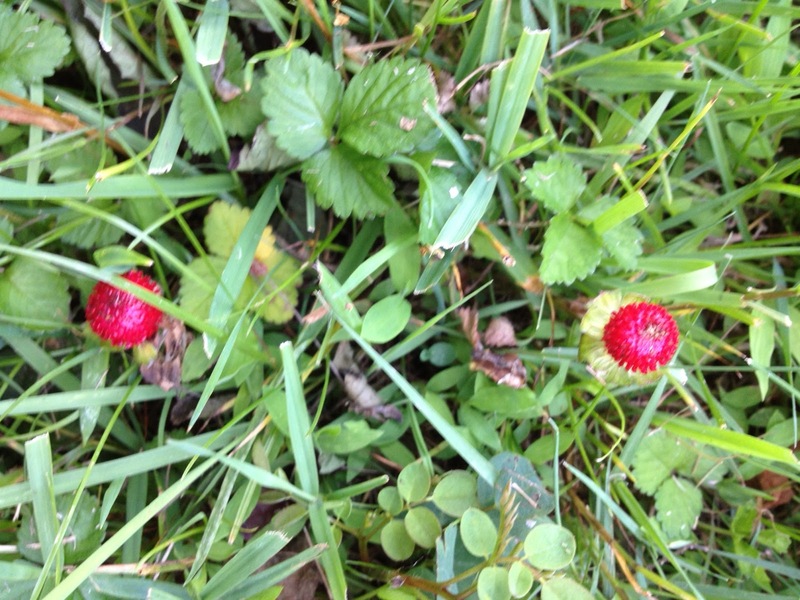 Aren't these wild strawberries, I wondered? 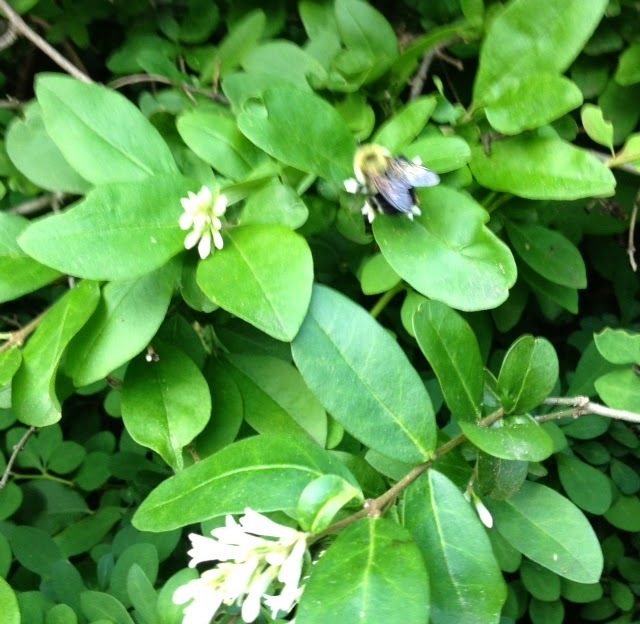 They were all over my mother in law's suburban New York City backyard. I thought I had hit a culinary jackpot. Visions of desserts featuring wild strawberries danced through my head. I had also seen them last year, but didn't have time to investigate them. But this time, looking for some pictures to take, they were a natural subject. 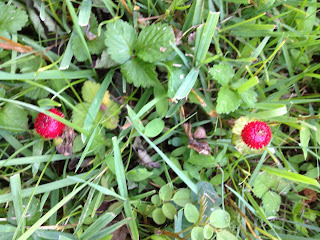 It had been so many years since I had been able to taste wild strawberries. Wild strawberries are tiny (perhaps the size of a pencil eraser, if that) but pack as much flavor in one tiny berry as in a huge commercial strawberry. They are a pain to pick (especially if you have a bad back, which I do), but so worth it. "Look at these!" I motioned to my spouse. I was so positive these were wild strawberries that I forgot the first rule about wild food. Don't taste wild food unless you know for sure what the food is. "These have no taste!" he exclaimed. So, I tasted one. The berries looked like strawberries. The leaves looked like strawberries. Did I luck into a field of....tasteless strawberries? One quick email to a friend's sister later, I had my answer. Potentilla indica, also known as Indian strawberry. They are a native of Asia. They were imported here, intended as an ornamental. In some areas of our country, they are now considered invasive. Fortunately, these don't appear to be poisonous, and my spouse and I are both still here. But, my dreams of wild strawberry shortcake are on indefinite hold. Sometimes, things just aren't as they appear. What looks desirable turns out to be - tasteless. Have you ever been fooled by something that looked like something desirable, but turned out to be something different? I returned yesterday from a trip to my mother in law, who lives near New York City, to find my gardening welcoming me with some surprises. 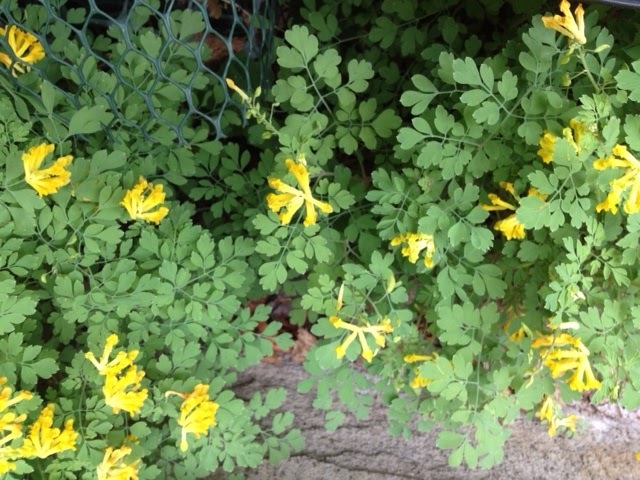 In upstate New York, where my zone 5b garden is located (near Johnson City, New York), we were welcomed home with rain, and lots of it. 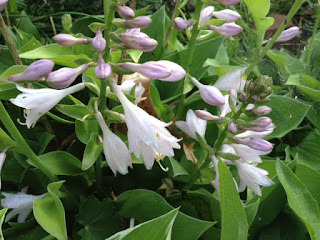 But also, there were some surprises, some brought to us by plants bought last year and blooming now for the first time. 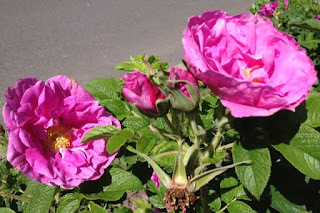 So, welcome to my Garden Bloggers Bloom Day for June, 2015, as gardeners from all over the world gather to show what is blooming in our yards and houses. First hosta of the year has blooms opening today. 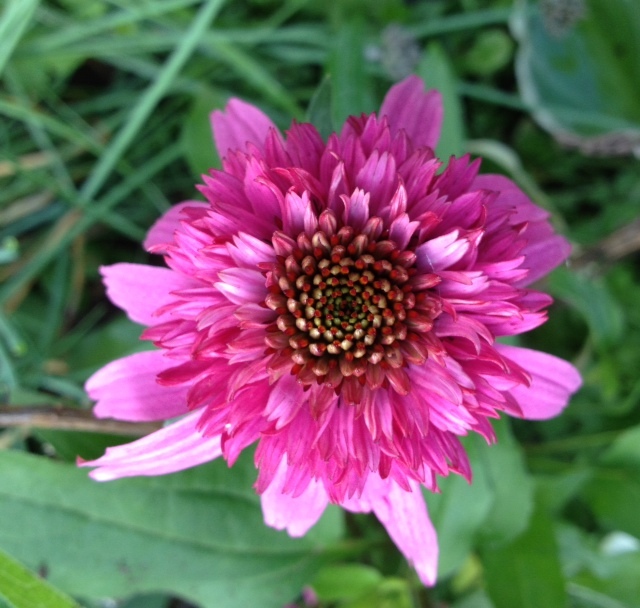 My purple echinecea, bought last year on a clearance. 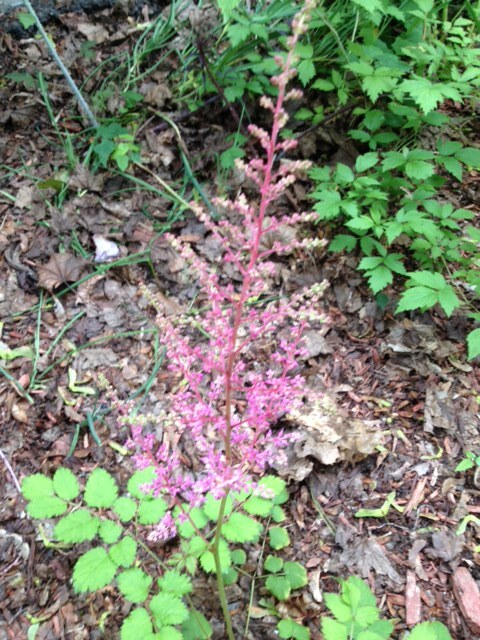 Astilbe grande mix, another plant from last year. Switching to annuals, my violas are still going strong. 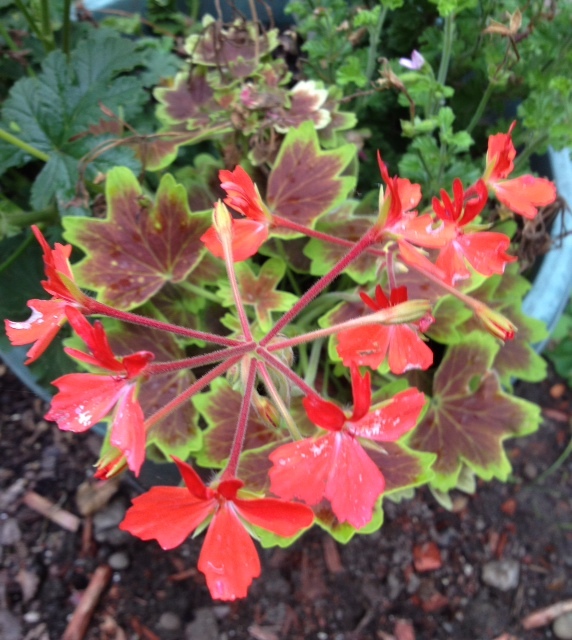 One of my several geraniums. 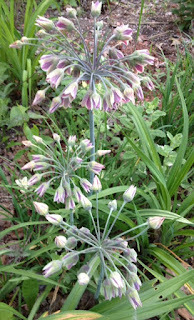 I am always saddened as spring melts into summer, but I have learned to appreciate every minute of the growing season. Most of all, I can appreciate us getting rain, but if I could, I would send it to California. Last night, we had storms and a lot of rain-some locations in our area got up to 3 inches (7.6 cm) of rain. Some neighborhoods had flash flooding, and we have another alert for tonight. Hard to believe, as the sun is shining. 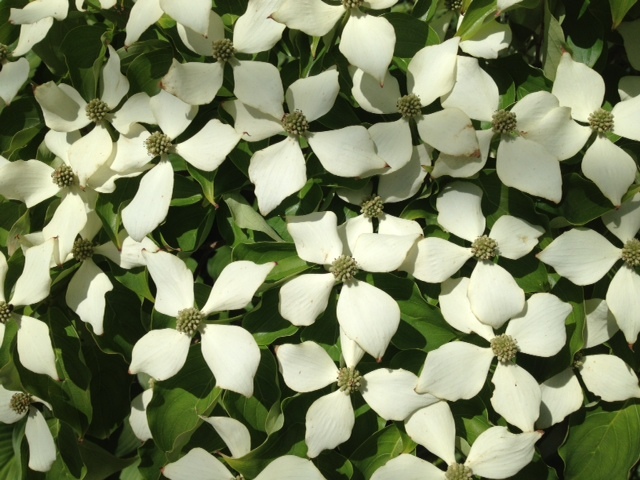 Visit May Dream Gardens to see what is blooming all over the world. Although we have reached the end of the 150th anniversary commemoration of the United States Civil War, I have decided to continue my Sunday Civil War feature. 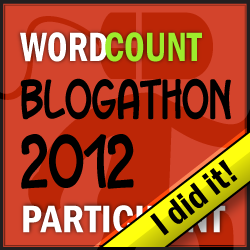 Thank you, all who commented on my blog when I asked if this feature should continue. About five years ago, I visited perhaps the most famous Civil War prisoner of war camp, Andersonville (Camp Sumter) in the Confederate state of Georgia. During the 14 months the camp existed, some 13,000 Union prisoners died in unbelievably horrendous conditions. Looking at the remains of the wells prisoners attempted to dig with their bare hands, and freely crossing the "deadline", the line that prisoners could not cross without being shot dead, was an unforgettable experience. About 40% of the total Union POW death toll occurred at Andersonville. The Union, of course, wasn't blameless. One notorious Union POW camp, Elmira, was located about an hour from where I live in upstate New York. Elmira will hold special ceremonies held in July of this year to mark the 150th anniversary of the closing of the camp. Here are some facts about two of the people who tolled to identify the war dead. One was a woman called the Angel of the Battlefield - Clara Barton, who was famous as a battlefield nurse during the Civil War later went on to found the American Red Cross. The other was a prisoner at Andersonville, Dorence Atwater, of the 2nd New York Calvary. Atwater worked in the camp hospital, and had secretly maintained a list, as best he could, of the dead prisoners. In June of 1865, he contacted Barton, who, in turn, joined an Army expedition to find out the fate of missing soldiers and mark as many graves as they could. In June and July, they reviewed letters, then spent even more time, heading into August, writing to the affected families. Atwater became known as the Clerk of the Dead. This is, online, his list, published by the New York Tribune newspaper in 1866. It is sobering to recall the time when the people of the United States were at war with each other between 1861-1865. May this never, ever, happen in our history, ever again. Can the Binghamton downtown farmers market survive? Yesterday was the first downtown Binghamton, New York farmers market of the year. Binghamton is a small city of about 47,000, which has seen better times, but is in the midst of a comeback. Students are moving in, but there is also a population of poor people who deserve not to live in a food desert, and also a lot of senior citizens. The downtown market struggles, year after year, to survive. It isn't mismanaged, as far as I know. And, you would think it is not in competition with a larger Saturday market a few miles away. But I don't know what the issue is. I wasn't even sure it was going to open this year until I left my office for lunch and saw the handful of tents with almost no customers. It allowed me to chat a bit with two of the vendors, but chat isn't what keeps their finances solvent. Lots of customers are. So, let me show you what a June market is like, here in upstate New York. 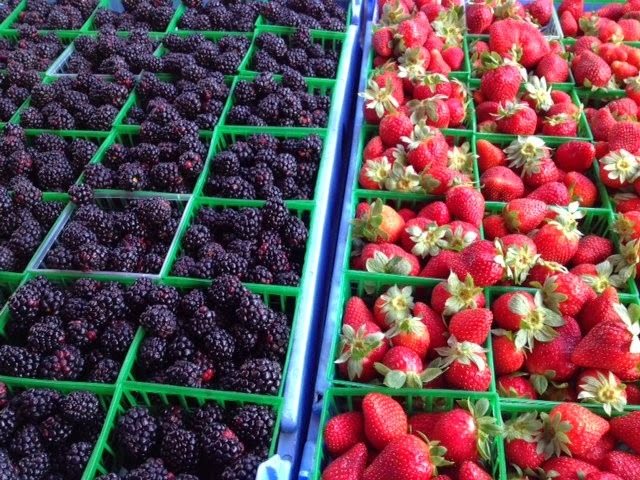 We are just starting our strawberry season (more on that in a minute) but right now, plants, greens and rhubarb rule the market along with honey, jams, meats, and eggs. 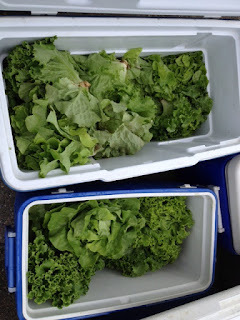 Last week, at a another local farmer's market, there was a wealth of lettuce. 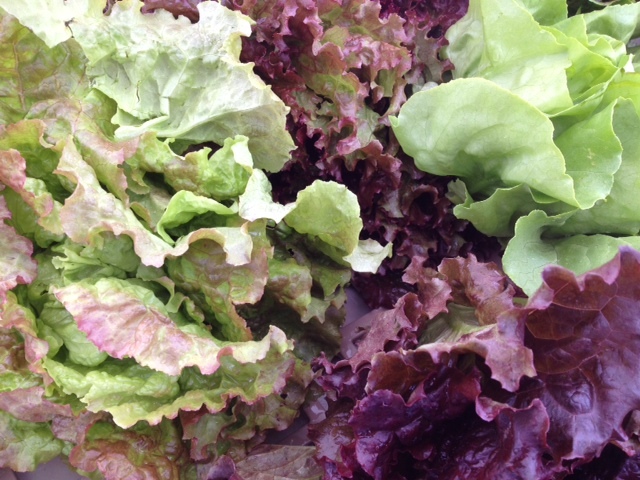 If you think lettuce means bland iceberg lettuce, it is time for you to step out of your lettuce comfort zone. Try some of these beautiful lettuces. They are like natural works of art. One vendor had coolers full of delicious organic lettuce. And now, you are going to expect a lettuce recipe from me. 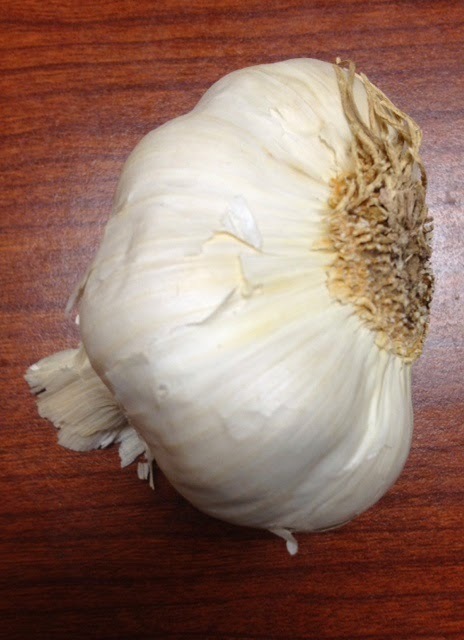 Well, our state senator, Tom Libous, has a website with some interesting recipes. Some are local specialties; many are not. Alas, no lettuce recipes. But sometimes my spouse, the family cook, will wilt lettuce quickly in a wok with a small amount of oil and some garlic, cook it just a few seconds, and serve. 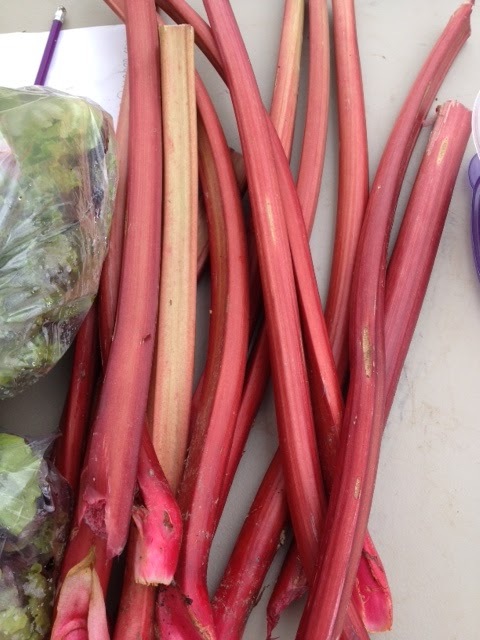 You either love rhubarb or you hate it. The Binghamton market was selling some. I...well, I don't love it. But here's a recipe for strawberry-rhubarb pie you may enjoy. How about some Hungarian Strawberry Soup? Perhaps most delicious of all, at yesterday's market, was a tasting booth where Cornell Cooperative Extension employees were sampling strawberries. They didn't have any of the recipe printed out, so I asked them to teach me the recipe. I hope I have this right. For the whole wheat tortilla chips, take a whole wheat tortilla, cut it into triangles, and sprinkle with olive oil and cinnamon sugar. Bake in the oven until crisp. For the salsa, take strawberries, chopped. Add blueberries (not quite in season for us, but North Carolina berries are nice, too.) Mix with a small amount of strawberry or apricot preserves. Serve salsa with the chips. This would make a simple (and healthy) beginning to a simple summer meal. 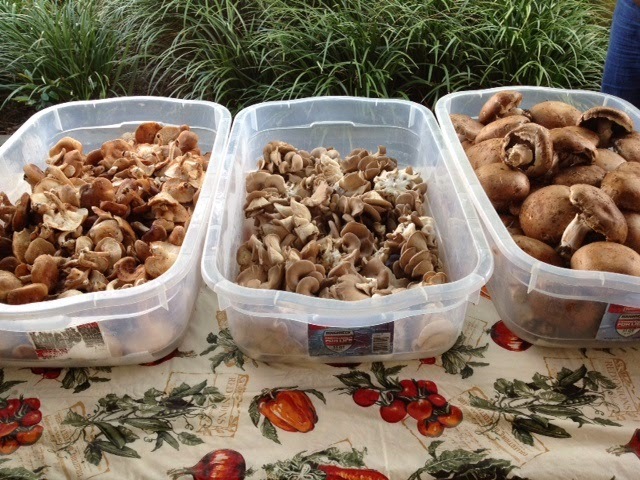 Thank you, Cornell Cooperative Extension. I hope I didn't mangle your recipe too much. I've gotten suggestions from my readers, over the years, of what the Binghamton market can do to thrive. I just wish this market would find its way. There are other, thriving, downtown markets in the United States, even in cities that have seen better days. 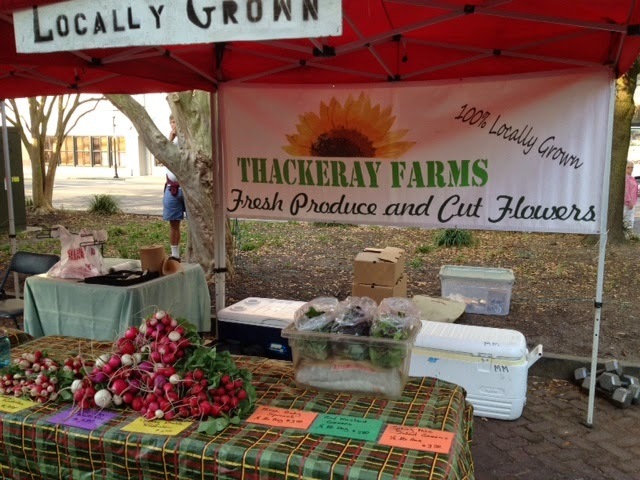 Does your area have a thriving downtown farmer's market? I've been reporting, from time to time, what I have been learning in a falls prevention class. As my regular readers know, I have fallen several times in the past few years. For the month of June, I am featuring a Falling Friday feature to share some of what I've learned with you. I am extremely nearsided, and I learned about the importance of vision at an early age. I've been wearing glasses since I was four. Since the age of around eight, my non corrected vision has been in the realm of what the State of New York considers legal blindness. Fortunately (at least up to now), it has been correctable with glasses. At our class Wednesday, we were treated to a talk by Diane McMillan of AVRE in Binghamton, New York. Diane is dual-certified as a low vision therapist and a vision rehab therapist, and personally suffers from a couple of disabling eye diseases. So, not only can she talk the talk, she also knows, from personal experience, what "it is like". "AVRE is a private, non-profit organization that serves people with sustained and severe vision loss. People of all ages, from infants to seniors, can and do benefit from our services. We offer a range of learning. living, and working options for people with sustained and severe vision loss." There are many eye diseases that can affect vision. Anyone suffering from these conditions becomes more prone to falling. 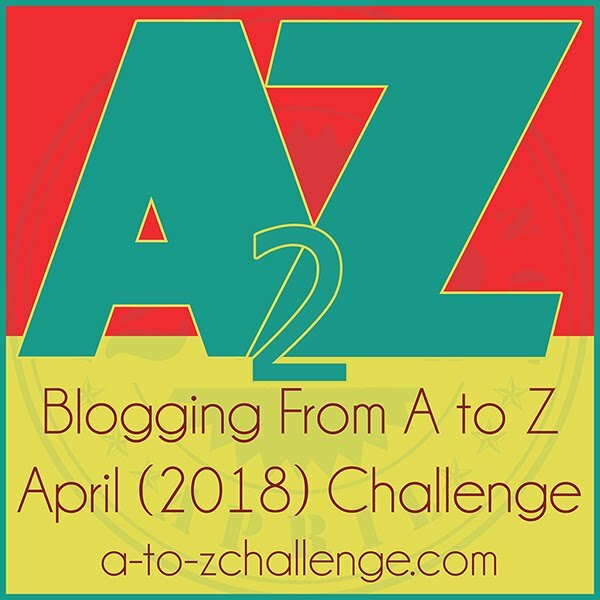 In fact, a blogger I enjoy, Amy Bovaird , has blogged at length about her life with a vision disability, her adventures (if I can call them that) in falling and how her life has strengthened her faith. 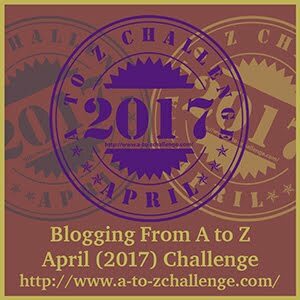 Amy's blog is Christian faith-centered but there are other bloggers with vision impairments who blog from a more secular viewpoint. It turns out that a couple of people in my class suffer from macular degeneration. Diane explained it so well, complete with pictures taken that show the way people with macular degeneration will see a particular picture vs. people with healthy eyes, that I understand it better now. Amy Bovaird's blog has a lot of information about macular degeneration. We also learned about glaucoma. 1. Be self aware. Test yourself monthly (it only takes a couple of minutes) with something called an Amsler Grid. Diane told us that you have any problems (the website describes what you are looking for when you use the grid) consider this an emergency and contact an eye care professional immediately. In general, if anything is amiss, err on the side of caution and report it to your eye care professional immediately. Sometimes, a timely exam can be the difference between a good outcome, and the opposite. 2. Have that annual eye exam! The eye cancer someone I know has made a full recovery from was detected on an annual eye exam. 3. If you are diagnosed with an eye disease, all is not lost. Some conditions can be treated. Other conditions may not respond to treatment, but with proper training, and assistance, you can still lead a worthwhile life. The two women in my class with macular degeneration were proof of that. #3, especially, resonated with me, because I have always dreaded the day the eye doctor will say "we no longer have a prescription for you." I can hope that day never comes. But if it does come, I hope I will understand it is not the end, but rather, a new beginning. Throwback Thursday - Is There Hope in a Blooming Kalanchoe? 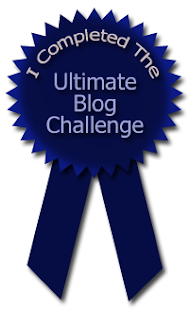 In June of 2012, I wrote the below post during an "Author Blog Challenge". Since then, the neighbor who gave me this Kalanchoe has passed on to where we all, eventually, will end up. But, the kalanchoe is still alive. And, in fact, it bloomed all winter and it still has a tiny bloom on it now. 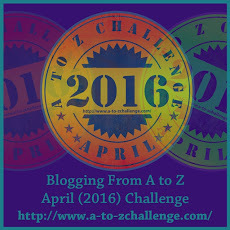 For the next few weeks, I am going to feature a "Throwback Thursday" feature on my blog. Enjoy the first installment. In a Reblooming Kalanchoe Is There Hope? "What is the single best piece of advice you've ever received about the publishing process and/or what advice would you offer to a first-time author?" That single piece of advice I learned from this challenge was "never give up hope." Hope of what? Hope of achieving your goals. Sometimes, just not giving up hope of survival. 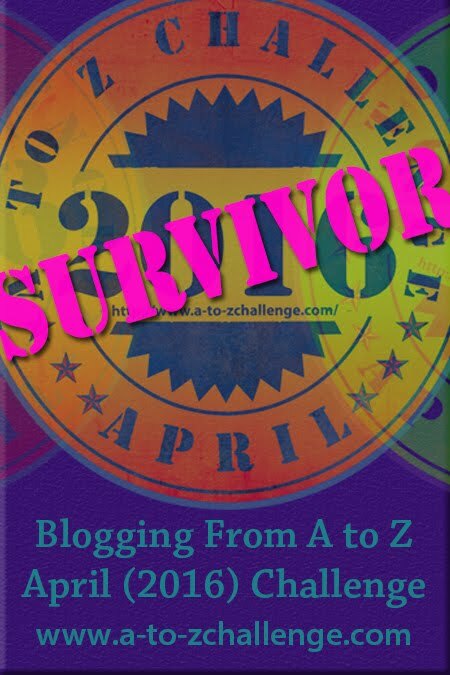 I knew, before the Challenge, that becoming a published author was hard. Now I have a better idea of just how hard and grueling it can be. In the midst of the struggle, a beginning author must believe in him or herself, and never give up hope that it will get better, that the goals will be achieved, that the hard work will pay off. And then there is the story of the kalanchoe. I have a neighbor who is seriously ill and probably will stay that way for the rest of his life. Sometimes, he sits outside in the sunshine, enjoying the small garden he and his wife have planted next to their rental house. I hope he enjoys the view of my front yard, with the flowers, the sometimes untidy herb bed, and my "flood angel". Some months ago, before he was diagnosed with this illness, he was in the hospital for another reason. Someone gave him a kalanchoe as a get-well gift. A kalanchoe, for the uninitiated, is a succulent plant with small blooms, which come in a variety of colors. They can be quite pretty. Ah, those hospital gift plants. You get them from people who know that flowers may not be the ideal gift. Flowers die after a few days, and if your recipient is allergic, those flowers are the gift that brings misery. 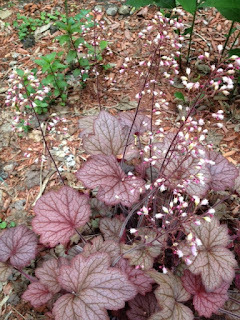 Now, a flowering plant, that's slightly different. There's a hope of keeping the plant alive after it finishes blooming. A foliage plant? Even better. My neighbor, after a period of enjoying the kalanchoe, offered it to me. I hesitated for a minute before accepting the plant. I take flowering plants seriously. I have two poinsettias in my upstate NY yard right now, along with two amaryllis. Any flowering plant I receive will get the best care I know how to give. I can't bear to have one die on me, although I have blogged about my less than stellar track record with orchids. I hesitated because a few years ago, I got a kalanchoe as a gift. I kept it alive on my windowsill for a couple of years. 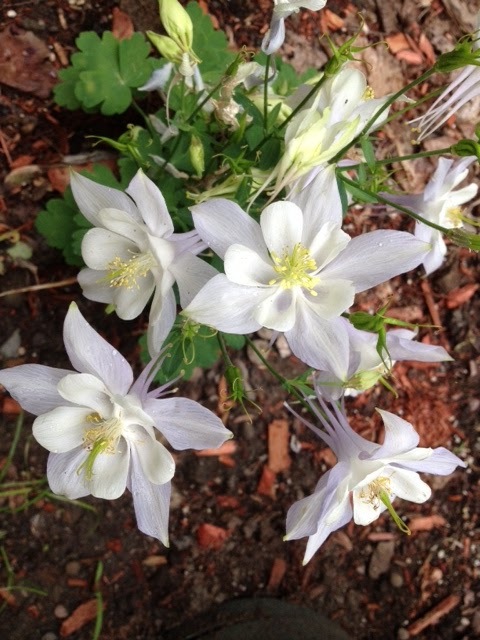 It never rebloomed and eventually it succumbed to white flies. I kept this one alive all winter on my living room table. Come late spring, it went outside, where I figured it would have a better chance of escaping white flies. Last night, I went out to water my back yard potted plants, and this sight awaited me. My neighbor's kalanchoe is starting to rebloom. We are rapidly approaching the end of Spring in upstate New York. Another couple of weeks and it will be summer. It seems like that there was snow on the ground just yesterday. Not that I am wishing for it to return anytime soon. But the knowledge of winter is what makes the enjoyment of spring so sweet. 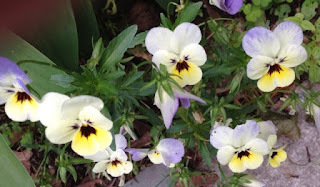 So I am going to keep this post short and sweet, and let the spring flowers do the talking. 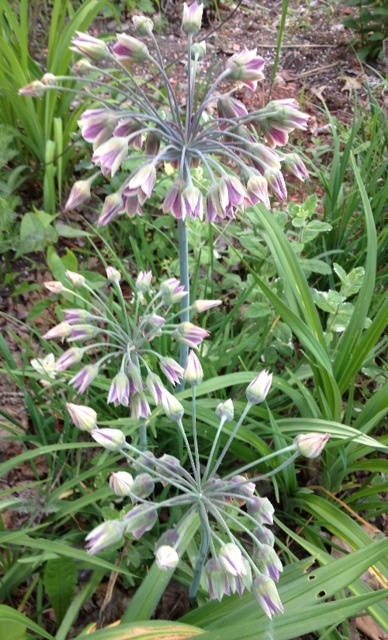 In my front yard, alliums bloom. Outside my garden, Korean dogwoods are finishing up their bloom. I don't have much room on my small plot of land for trees. 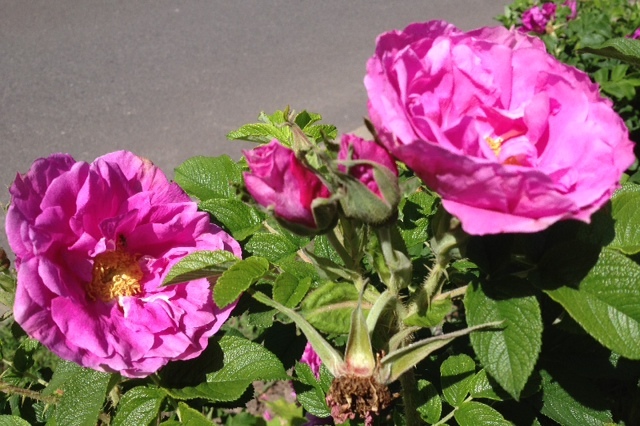 And, we finally have roses blooming in our neighborhoods. 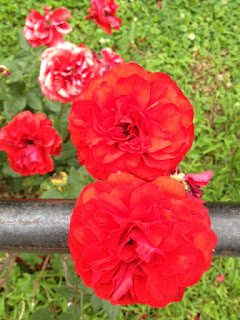 These were fragrant, too.